In the main menu, hover your cursor over the "Add" menu. 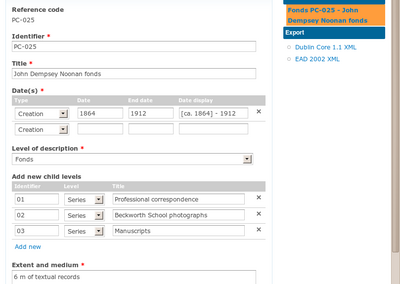 Select "Archival descriptions" from the drop-down menu. ICA-AtoM takes you to a blank edit page for data entry. You can quit the create process at any time by clicking the "Cancel" button in the button block; no new record will be created. Click the "Create" button in the button block to save the new record. 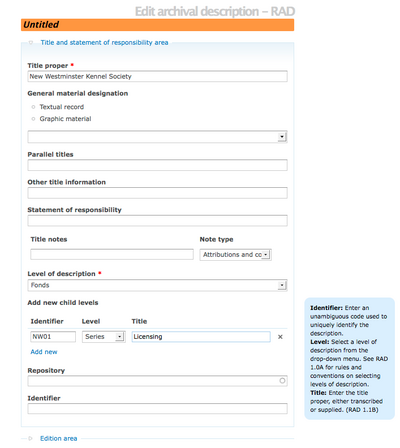 The default status of a newly created archival description is DRAFT. 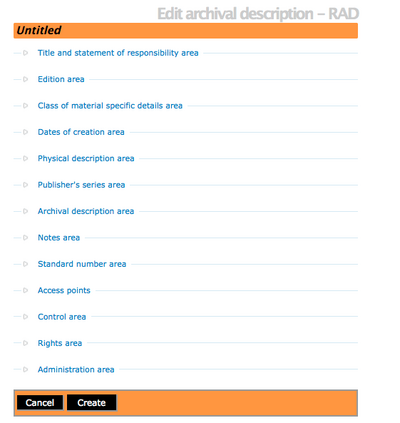 Under the Administration area users with publication privileges can select PUBLISHED as the new status of the archival description, making it available for read access to the public. Introduced in Release 1.3, the number of characters allowed in the "Title" data entry field has been increased. See Issue 1628. 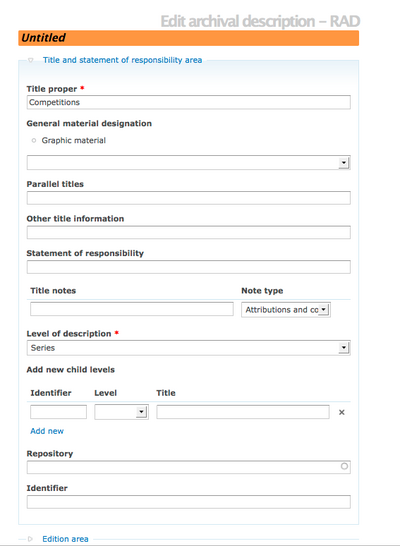 In the archival description edit page, in the ISAD identity information area, or the RAD title and statement responsibility area, enter the relevant data under "Add new child levels". Note that you can add as many levels as needed at one time; for example, to add multiple series to a fonds or collection, fill in the fields under the "Add new child levels" and add as many lower levels as desired. When the record is saved, you will be able to see the new child records in the context menu. The example provided uses the RAD template for a Fonds level description in which the user has started adding a new child at the series level, titled: "Licensing". Here is an example of the ISAD data entry template for an existing fonds that the user is adding new child levels.Remember to save all changes. Once you have saved the child levels, you can see in this RAD example that the "Licensing" series is now in the context menu/ treeview. If the levels need to be changed. From within the context menu, logged-in users with permission can re-arrange child level descriptions (e.g., Series, Files, Items) within the Fonds treeview by simply dragging and dropping the selected resources. In the archival description view page, click the "Add new" button in the button block at the bottom of the page; this will create a new description that is one level of description below the description currently in the view page. When the record is saved, you will be able to see the new child records in the context menu. 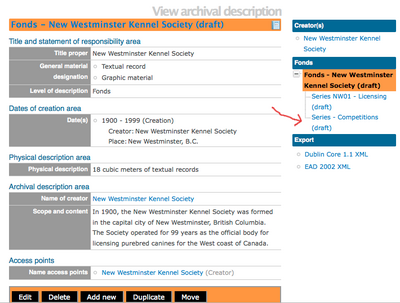 It is important to note that after clicking on the add new record button, the edit archival description template will appear, but no reference is made to the parent archival fonds. The example shown is using the RAD template, and you can see that the header is "untitled". Enter appropriate information into the template for the lower-level descriptions, and remember to select the level of description. Remember to click save once you have completed entering the data. After clicking save, the user is returned to the Archival Description for the fonds level, but the new child-level has been added. You can see this in the RAD example provided. 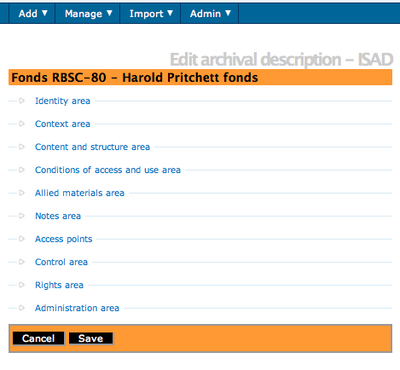 At the bottom of the archival description edit page click the duplicate button in the button block to make a duplicate archival description. The user is directed to a new screen and can edit the duplicate archival description, which is an exact duplicate of the original archival description. Before starting the edit page provides a warning. After editing the duplicate archival description, the user can cancel or save the changes. 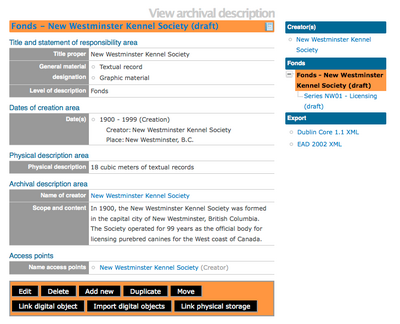 Saving the changes creates a new archival description. This page was last modified on 4 September 2012, at 17:59.